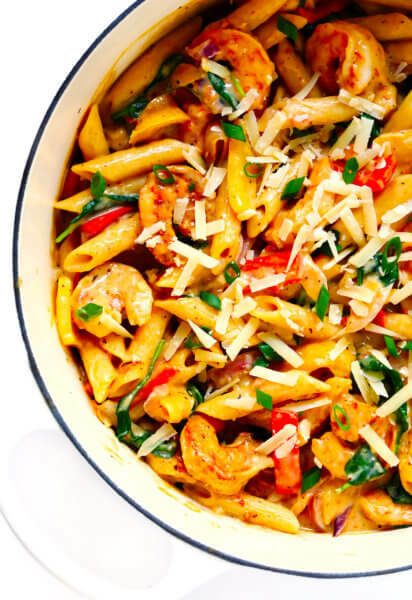 Do you have a quick “go-to” dinner recipe? 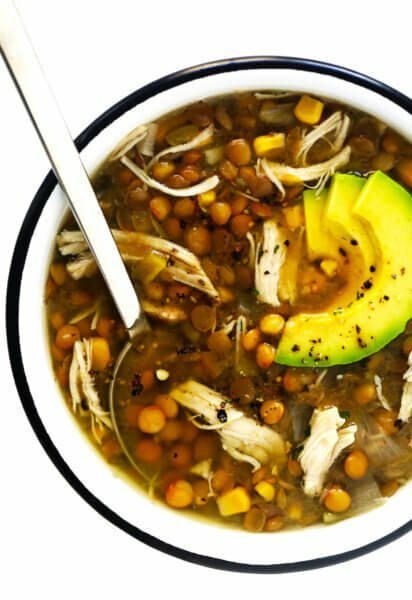 A fallback for when you arrive home from work uber-exhausted, and just want to whip up something healthy and delicious in a snap?? Well any roommate of mine who’s heard the oil start sizzling in the skillet minutes after I walk in the door will tell you I undoubtedly have a favorite: blackened tilapia. It’s true — I make this all the time, but have yet to ever tire of it! While it can easily stand on its own, you could also serve this recipe topped with creamy sauce to balance out the spice. (For some reason I’ve never been a fan, but know that many are!) Or, it works fantastically in fish tacos or on sandwiches. 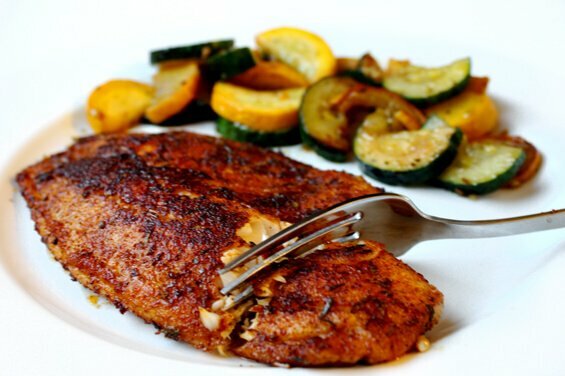 This 10-minute blackened tilapia is one of my go-to weeknight meals! Heat 1 Tbsp. of oil per filet in a skillet over medium-high heat. Once oil is almost smoking, add filets and cook for about 3 minutes per side, or until fish is opaque and can be flaked with a fork. Remove from pan and serve immediately. At the risk of undermining my own recipe (clearly not a big concern of mine :-)), I feel that I absolutely must give a recommendation for my favorite blackening powder in the world. It can be found at none other than our local Planters, located down in the River Market for all you KC locals. Thankfully for others, it’s also available for order online! Seriously, this stuff is fantastic . I’ve given it to countless friends and family members who love to cook, and everyone has said hands-down it’s the best they’ve ever tasted. Like any blackening powder, it’s also great on any other meats or seafood, veggies, pita chips, guacamole…you name it! Very good to know. We’ve got a lot of tilapia in our freezer. We’ll have to try this. W.W.J.E.? – tilapia, of course! The photo all by its lonesome made me even more hungry than I already was. Beautiful blog! 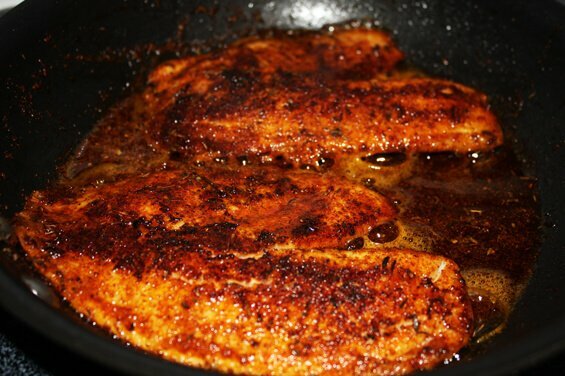 Do you know the recipe for creating a quick cream sauce that can be added to the blacken tilapia recipe? Hmmm…one easy idea is to just do a mayo sauce. (1 cup mayo, plus maybe some lime juice and cilantro. Or lemon and flat-leaf parsley.) Or you could combine mayo and sour cream (or yogurt!) and do the same. And a dash of hot sauce always seems to make any creamy sauces better in my opinion. This was a delicious recipe. Thanks for submitting it! Delicious and so simple..love Tilapia! Tried this tonight and it was delish! The hubs and son loved it. Had asparagus with it. Going to have to try this. We love Talapia, so looking for new recipes for it. What brand is the blackening powder? What is the name of the blackening powder you talk about? Right on! I have struggled for years to make good blackened fish, I followed your recipe to the ‘T’ (ok that’s a lie: I had no Thyme and I subbed Chile powder for the ground red pepper), and it was awesome!!! Quick, easy, delicious and healthy…me and the Mrs. thank you Ali! What is the name of the Blackened seasoning you can buy online you like so good. You did not put it in your message. Hi !! You recommended a blacking powder above, but did not name it !!! I’d like to order some. Do you have a good dill sauce to use with Salmon and Tilapia.. I think it would be good with either. I don’t cook, but this was soooo easy. 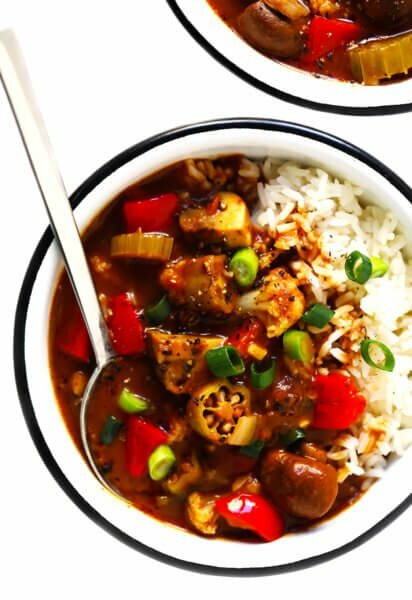 If you like New Orleans style “blackened”, which is peppery, hot, and kills any fishy flavors, this is the recipe for you. Thank you. I made this tonight and it was truly delicious. Wrote it on a card and it’s in my recipe box for good. Thanks! Tonight was the first time I’ve ever make blackened tilapia I felt that this was a good recipe to use, the recipe was very easy..unfortunately I was little disappointed. It’s was a little too spicy for me..and I can handle some pretty spicy foods. But I did scrape off some of the seasoning to make it a bit more manageable to eat. But I do commend you for sharing your inspirational recipes for the us cooks out here. Don’t knock it til you try it. I loved that this was so easy to make – so thank you! My boyfriend and I did however find it a bit salty. I think next time I will omit the salt or do less salt. Other than that it was good! Also, thanks for the recommendation on the blackening powder. I am definitely going to give it a try. this sounds yummy but quick question, has anyone tried frying it with olive oil instead of vegetable oil? Pingback: 15 крутых блюд, которые можно приготовить за 15 минут | Жми класс! Thank you, Evelyn! So happy it was a hit with you and your husband! We’re so glad to hear that, Tami! We’re so glad you enjoyed it, Tami! 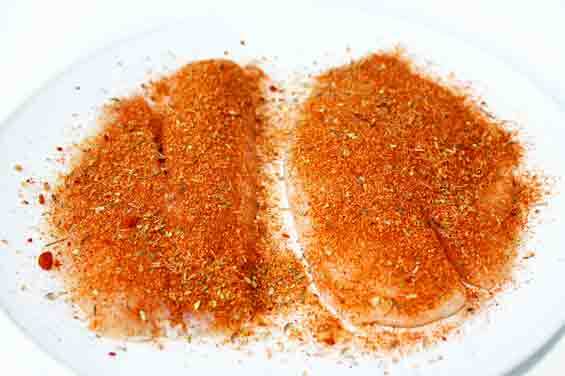 Obviously this was the simplest of meals, but that spice mix is a great recipe and perfect for the fish. Thanks so much! We’re glad you enjoyed it, Laura! how many servings of fish are for the blackened powder?? I used the seasoning on tilapia a few times until my boyfriend says “Can you season the brussel sprouts like this, too?” So I made a few batches and put it in an empty container to also season our vegetables the same way. We’ve also been eating tilapia a lot more often! Thanks!